I have a love hate relationship with Halloween. I know a lot about the traditions and like reading about them. As a child I enjoyed the simple things, like apple bobbing and silly scare games at halloween parties. But the way it has become a huge deal (old traditions enlarged and migrated back to us from America I guess) especially with the pumpkin obsession (RIP my Instagram feed at this time of year - if you don't like pumpkins avoid Instagram) and the 'trick or treating' which, while cute with little kids, with teenagers is just scary, and not in a good way. And then this year of course the world feels like more of a horrific place than in years gone by. Threats of nuclear war (common in my childhood but I had thought long gone), terrorist attacks, increased knife crime, all of these things make 'celebrating' horror feel just wrong. Looking around the shops for halloween party and costume ideas I couldn't giggle at fake blood, artificial slashed throats, comedy knives, hachets, and even, in Poundland, Donald Trump costumes and themed decorations! And so I decided to ask some friends what they did at halloween that could be enjoyed by all the family without the usual horror or the dreaded pumpkins! and here are some of the ideas. Becky, clearly my soulmate, just hides! "I mainly hide! I don't mind the little ones coming to the door, but beyond 7 o'clock I won't answer and pretend we're not in. I hate the gangs of teenagers who don't even dress up. " Lizzie, given up on the niceties on halloween, just gets drunk! "Many years ago as a joke I back combed my hair put on a black sack and handed out rubber cables. As I've gotten older I've become much more aware of how embarrassing this is but it's become somewhat of a tradition. So I have to be very drunk every Halloween. It's something I hope my children will do for me once they're of age"
Laura focuses on doing some halloween crafts with her family, and while she does go trick or treating, only to houses she has previously checked with. "Mine are just 3 and 5 so it's more Halloween related crafts, movies and snacks than anything. We do go trick or treating though as the kids love it, but only go to obviously door knocking friendly houses, friends and neighbours that we know won't mind. This year there's a local disco for little ones so we may do that instead"
Sarah celebrates her birthday with the family, with a meal out. "We love Halloween in our house, it is also my birthday. We do costumes with a different theme every year and then do family photos and often go out for dinner dressed up." Louise has a doorstep party! Which sounds really fun. "I was never allowed to go trick or treating as a child as my parents hated the idea. 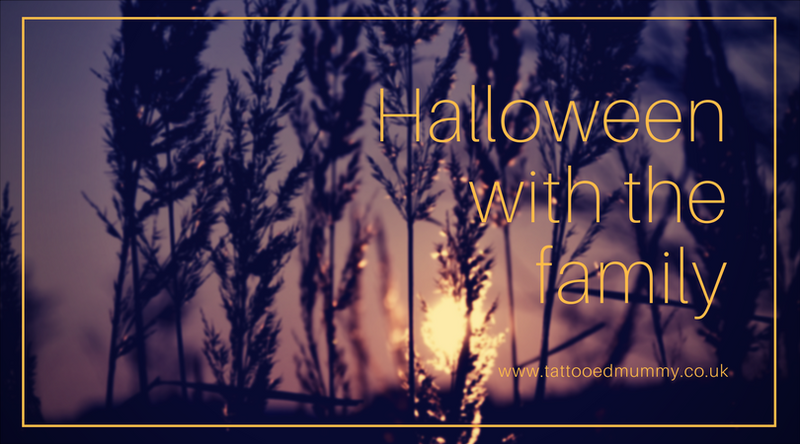 Now I love Halloween but the idea of not trick or treating has stayed with me and so instead, we hang out with snacks, music and wine and have a 'doorstep party' with our friends & neighbours as they call in!" Jada likes a halloween movie, but in costume! "A Halloween night in, a “spooky” movie - age suitable of course, popcorn, a treat and we do sometimes have a Halloween buffet style tea - it’s easier than cooking as the door constantly knocks by trick or treaters. We also do dress up too so we’re not missing out on the costume side of things! " Following Jada's lead I think that on the 31st I will be wearing my Deadpool morphsuit (just in case anyone calls) while watching a comedy halloween movie and munching on autumn snacks like apple cake and popcorn. Although we are squeezing in a halloween party on the 27th - a party at Fizz's dog groomers! So there will be some silliness and fancy dress and no doubt tricks and treats at Pooched Paws Halloween Party. What will you be up to? And which (not too scary) halloween movies would you recommend?